It’s a communication medium with propulsion. As soon as a visitor to your website hits that play button, your vision comes to life. These words aren’t alive. They’re lying here, dormant, waiting for you to read them. If you don’t, then they’re defunct, they don’t demand your attention. But once that play button is clicked, a movable feast is set in motion and your visitors are along for the ride. So are you going to bore them, or captivate them? 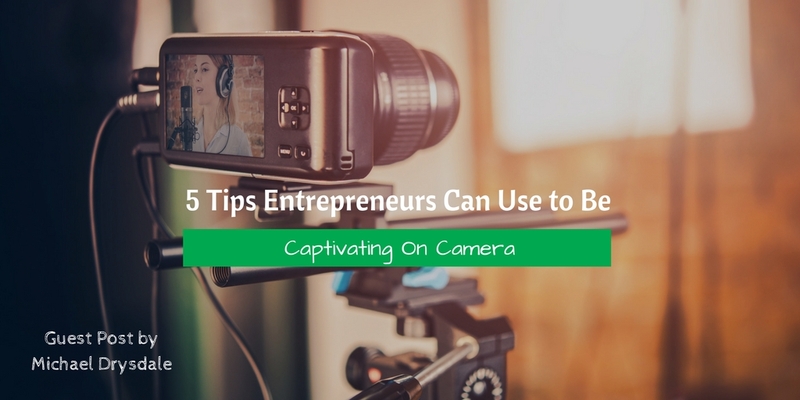 Here are five steps you can take to be more captivating on camera from an actor, who’s been there and done that on stage and screen. Your eyes are the feature your audience will be most drawn to and also where they’re most likely to make a connection with you. As Shakespeare once said, “Your eyes are the windows to your soul,” but don’t let that scare you off! Just understand that you want to avoid filming under harsh down lights, because your brow will cast a shadow over your eyes. The result will be underwhelming as your audience will have a hard time feeling connected to you. Preferably, shoot in front of a natural light source that illuminates your whole face. Once you’ve got the lighting right, get comfortable looking into the lens. This might take a while and a few relaxing breaths, but don’t start recording until you’re relaxed and ready. It’s so easy to be self important when we’re standing in front of a camera. Too often we default to imagining that the stakes are enormous, that the life and death of the company rides on this little video and that if it doesn’t go well, it’s all our fault. Which is rubbish. My advice when filming, is to give away as much responsibility as possible. To the camera, the microphone, whoever’s filming/directing you, even the information you’re relaying (even if you wrote it yourself) the truth is it came from years of being taught by experts in classrooms or books, so even that isn’t your responsibility. You’re just the messenger. If your audience have a problem with it, they can take it up with the experts. For the sake of your speech, embrace being the experts messenger. All you’re responsible for is to be yourself, so just have fun with it. The best presenters always speak to the camera as if they were speaking to a good friend. Who would you delight in saying this to? Who would make you feel more relaxed, more playful, excited, even certain if this were a conversation you were having with them? It might be someone you know, or even a celebrity. Play around with a few choices in rehearsal and make it real for yourself. Close your eyes, take a deep breath, imagine their face, let a smile creep across your mouth and when you open your eyes, look into the camera and talk as if you were speaking to them. A fun exercise can be to do a practice run where you use the person’s name as you talk, just to trick your body into what it feels like to speak to that person. The videos you’re creating are a transitive exchange, they should be done with an major objective in mind (an impact you’d like to have on the audience) and a lot of mini objectives along the way. To inspire, to entertain, to embolden, to impassion, to educate, to challenge, to charm, to humour. As an exercise go through your content and get clear on how you’re attempting to influence the audience in each moment of your speech and try to make us feel that in your voice. Remember that everything you say is in service of the audience. Otherwise why are you speaking? Speak with the purpose to affect a change in them. To change their life. Own that opportunity that this moment has given you and really go for it. Certainty and conviction are important when building up the features of a pitch, but often times the clinching sentence is best left as a whisper. That might not be a literal whisper, but play with lowering your volume in a way that says “Oh wow, come a little closer, you’ll want to hear this, this is the best bit.” I also like to refer to this as the ‘I’ve got a secret’ tone, it builds anticipation and makes your audience lean in, which is perfect to set the stage for the most valuable moment of your speech. The truth is that video is most alive, when you’re alive within it. Your authenticity feeds its effectiveness. The basis of these tips are to simulate the behaviour you have when you’re just naturally communicating well. We all have moments in our lives when we’re great communicators and we can recall amazing stories like a kid in a candy story. Follow these five steps on a regular basis and you’ll be closer to being able to captivate your audience every time you speak on camera, rather than just when inspiration strikes. Use these tools, be true to yourself and I’ll see you the next time I press play. Michael Drysdale is a public speaking and presentation coach who co founded the company Evoke Communication. For more information, tips and details on their services check out their website or join Evoke’s free public speaking community on Facebook.